Welcome to Elite Motor Sports, your one stop shop for wheels, tires, suspension systems, lift kits, alignment, powdercoating and more. We aim to be Woodland’s premier motorsports service provider and are committed to providing our customers with the absolute best in customer service. Whether you’re looking for a new set of tires, in need of replacement parts or otherwise, look no further than Elite Motor Sports in Woodland to assist you in all of your needs. While we are committed to providing you with the absolute best in a wide variety of services, tires are a big part of what we do here at Elite Motor Sports. Bringing you the best quality tires from brands like Michelin Tires, Pirelli Tires, Goodrich Tires, Nitto Tires, Fury Offroad, Bridgestone, Firestone and more, tires are something we know quite well. With that in mind, we’ve decided to dedicate this first blog to something that we all can relate to – the horrors of flat tires. None of us enjoy getting a flat tire, no matter what time of day or climate. It’s nothing short of an inconvenience, and the last thing that we want to do is to have to replace one or more of our tires prior to when we were originally planning on doing so. In part one of this blog series, we will look at a handful of ways that we can avoid getting flat tires as well as being safe in the instance that we do. Read on to discover more! One of the most common causes of flat tires has to do with screws, nails, and other sharp objects puncturing either the sidewall or another area on your tire. While none of us are consciously driving through areas that are littered with sharp objects (nor are we aware of it when we do) the most common areas where sharp objects like screws and nails can be found are in areas that are either under construction or near construction areas. Sometimes areas that are under construction are unavoidable, as they are either main streets or key areas in our daily commute. By avoiding construction zones, we can also avoid the dangers of getting a flat. If there’s a detour and you see a construction zone coming up, go around it and re-enter the street when the construction zone has ended. While it may be a slight bit of an inconvenience, you’ll be thankful that you did. Contrary to the popular belief, punctures are not the only way that one can acquire a flat tire. Keeping up with your tires and making sure that they are properly inflated is a great way to ensure that your tires won’t go below the recommended PSI level. Don’t overcorrect, though, as overfilling your tires can also put you at risk of getting a flat or bruising your tire. Look in your user’s manual or on the sticker located on the inside of your car door to find out what the correct PSI level is for your tires, and fill them accordingly. Those are just two tips for avoiding flat tires. 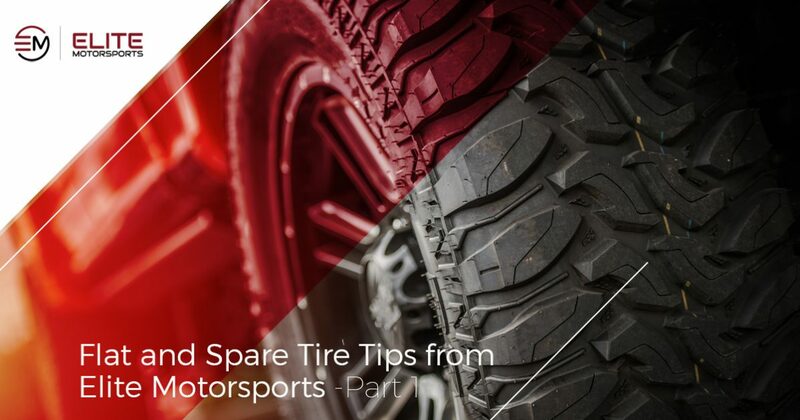 We will continue this in part two of our blog series, but until then, for all of your Woodland tire needs and more, contact Elite Motor Sports today.